Manufactured to aid care workers in residential homes, our Male Urinal with Handle and Cap helps to effectively remove waste with bed bound patients. Using a strong and durable polypropylene in it's construction, the purpose-driven designed urinal features gradual markings along the model to help monitor body fluids. 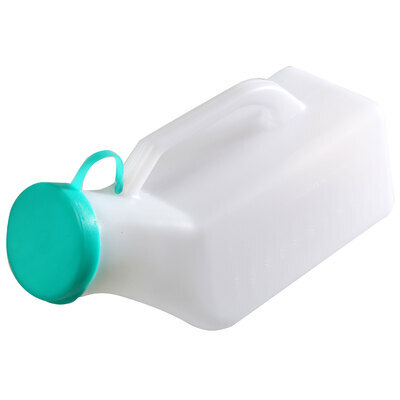 A secure lid and handle reduces the risk of spillage while helping to hygienically transport waste after use. Reusable so as to save on budget usage, this male urinal is suitable for washing at 100 degrees or steaming at 120 degrees, allowing it to coincide with your existing hygiene control regime. Alternatively, household disinfectant can be used to ensure effective cross contamination control. We also stock a Slipper Urinal Pan, to help fully support our care home clients.